Home » Events and Blogs » Blog » The story of Kombucha, Kefir and the Gut! The story of Kombucha, Kefir and the Gut! Once upon a time, there were two beverages (best of friends), who set out to heal the world! It seems to be the latest craze in health right now – Kombucha and Kefir. Why is it all the rage? Well, first of all, both of these liquids are PHENOMENAL for the gut. Not to mention, they actually taste pretty good too! And with summer right around the corner, having a cool glass of Kombucha over a cool glass of coke will serve you so much better! Let’s start with Kombucha (pronounced like kom-butcher). Kombucha is a probiotic, fermented black tea. It’s made by adding a culture of bacteria and yeast to a solution of tea and sugar. Whilst this may not sound appealing or appetising at all, Kombucha is delicious. The taste resembles iced tea and depending on the brand and type of Kombucha you purchase, it can sometimes be fizzy as well! The beneficial, probiotic organisms in Kombucha aid digestive health and immune function by helping to break down foods. This leads to the body being more able to absorb the nutrients from foods, thereby giving you more energy, a healthier body and a stronger immune system. Kombucha boosts your immunity as it energises and boosts the metabolism. There are also claims that the drink has the ability to prevent and heal leaky gut and stomach ulcers. Additionally, Kombucha gently cleanses the liver by removing toxins from the body. Kombucha can be bought or you can make it yourself! There are so many flavours and combinations to try. Next up is Kefir (pronounced like kef-ear). Kefir is a probiotic, fermented milk beverage. It’s made by adding kefir “grains” to milk (usually cow’s or goat’s milk). The taste is that similar to yogurt and contains more active bacteria than most probiotic supplements! It’s a rich source of calcium, protein and B-vitamins. It’s also a fantastic way to give your immune system a boost and optimise gut flora. Not only this, Kefir also protects against harmful bacteria, improves bone health and aids digestive health. Like Kombucha, Kefir can be bought or you can make it yourself! 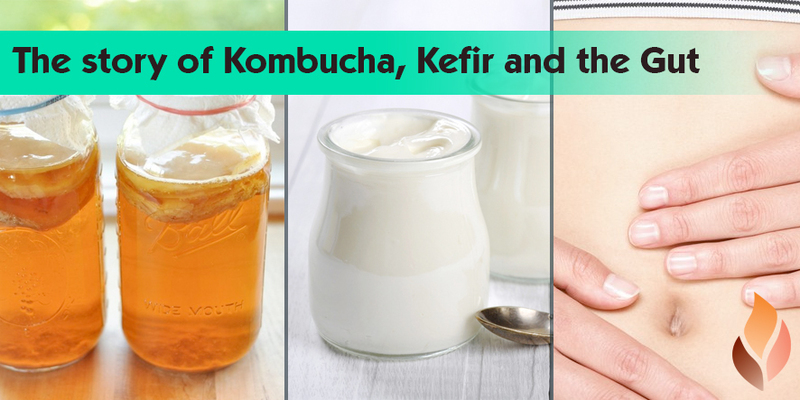 So, there’s the story of Kombucha, Kefir and the gut. Two fermented beverages that heal you from the inside, out. Incorporate one or both of these into your diet to see the change, difference and impact it can have on your life! The gut then lived happily ever after!